Maybe you’ve already seen and tested it. Since one of our latest Android app updates, it is now possible to open it directly via push notifications. (Dear iOS users, this doesn’t work for you yet, but it will work very soon!). And what does this have to do with nello one and Android Wear OS? Why we like opening via push notifications. Because now you can open your front door even faster. How? Directly from your smartphone as soon as you receive a push notification. And if you have a Smart Watch with Wear OS by Google, you can now open your front door with a single touch of your Smart Watch. That means even though we don’t have our own Android Wear app yet, the long-awaited opening with Smart Watch is now nevertheless possible! We think that’s pretty nice – often you don’t always look at your phone when you’re working, but you always have your watch in view. And how does opening work with Android Wear OS and your Smart Watch? Someone rings at your doorbell. 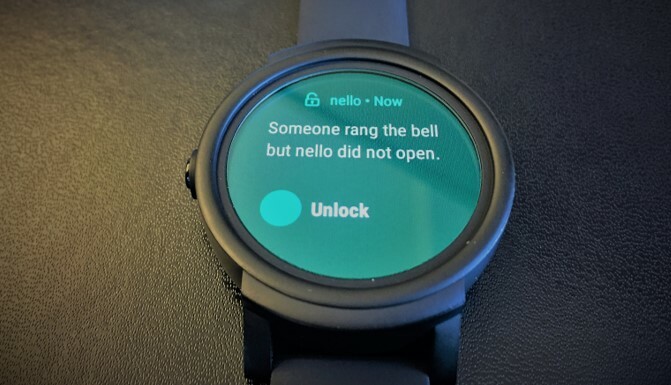 nello informs you with a push notification. You simply open the door by tapping on your Android Smart Watch. Everything else takes care of itself! Just like us, many of you nello users already use the feature and are enthusiastic. If you would like to share your experiences with us, please feel free to write to us at hello@nello.io – as always, we look forward to hearing from you.